There’s a little bit of magic in every charm bracelet. Because each charm symbolizes a moment or memory special to the wearer’s heart, the bracelet transforms into something more than an accessory; it becomes a story. Emotional connections are often woven into the most personal of charm bracelets, and of course every bracelet has more than enough room for fun and playful pieces. 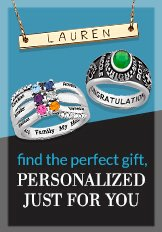 Let our collection of charms help bring your story to life.